One of the front-running LMP2-class cars—who was briefly in second place overall—found racing’s ultimate catch-22. How do you serve a stop and go penalty when the starter that makes your car go doesn’t work? Starter issues have affected a couple LMP2-class cars, including the current race-leading No. 38 Jackie Chan DC Racing car and more recently, the No. 13 Vaillante Rebellion car. 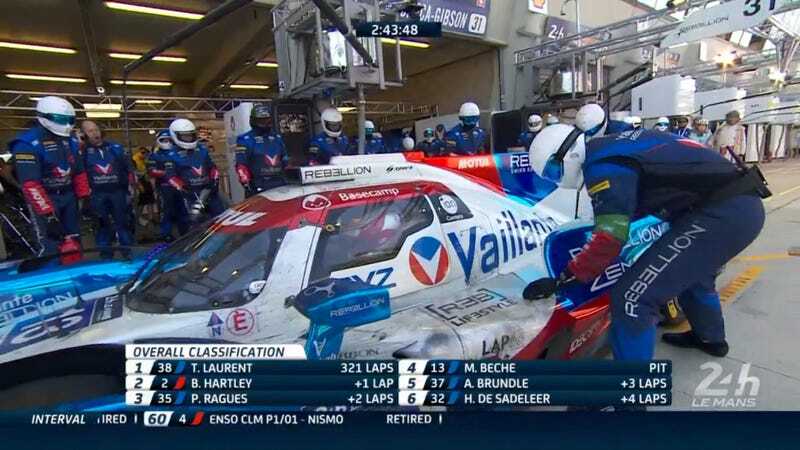 All of LMP2 uses a spec Gibson engine, the starter for which apparently hates Le Mans’ sticky heat this year. The No. 13 tried taking the rear engine cover off to add a cooling duct, hoping that this would alleviate their starter woes. They ultimately ended up hammering on the starter to get it to work. Problem is, the World Endurance Championship considered the work the No. 13 team did to be a pit lane infringement. They did work on the car while the engine was on, which was a big no-no. The team was given a stop and go penalty for the infraction, but when they couldn’t start the car to leave, they lost their position in the race. This was devatstating, as it gave second place overall to the No. 2 Porsche 919—one of the top LMP1 cars that broke early in the race and was trying to claw its way back to the front. The No. 13 encountered the same problem yet again when it came back in for a routine pit stop. The car has to start under its own power with no assistance beyond the driver. It wouldn’t start, so the team took off the rear while the car was off this time to hammer on the starter. The crew member with the hammer accidentally dropped the hammer in the engine bay, but quickly picked it back up. The rear cover was then put back on, and the car started, but it’s painful to watch them fumble through every pit stop because of a busted starter. Now the commentators say the No. 13 is under investigation for another pit stop infraction, which could potentially drop them further in the standings. In the front of the race—an insane race that could have a slower privateer LMP2 win over the faster, big-money, manufacturer-backed LMP1 car—still sits the No. 38 Jackie Chan DC Racing LMP2. Unfortunately, they had to come into the pits to fix some lights at the rear of the car that weren’t working. Worse yet, the No. 38 team were slow to put the new rear end for the car on while the No. 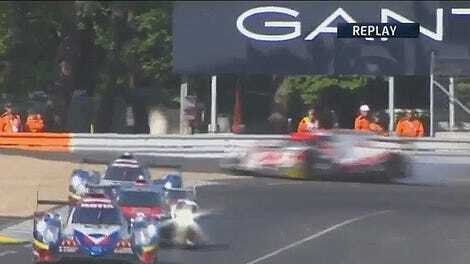 2 Porsche 919 was quickly gaining on them. It was a devastating fix to bungle when every second spent turning laps counts. What’s exciting about this bizarro-land battle for the overall lead is that both potential winners right now are incredible. The No. 2 Porsche 919 is from the top LMP1-H class, where manufacturers pour big bucks into custom hybrid prototypes, but it also had a time-consuming hybrid motor failure early on that forced them to drop to 57th place. They’ve spent their race clawing back from that, and have gotten all the way back up to third place over the course of around 16 hours. But then you have a lower-tier, slower No. 38 fighting to keep the No. 2 from having that overall win, and one of their drivers, Thomas Laurent, is only 19. He would become the youngest ever driver to win Le Mans if the No. 38 can pull off a win—in an LMP2, no less. I’m still in shock that an LMP2 is leading overall right now, mainly because of mechanical woe. And who knows? Maybe even the No. 13 will claw its way back up to the lead. There’s over two hours left. It’s been well proven that anything can happen in this race. Somehow, I miss the reliability of the best cars Audi put out in Le Mans’ top LMP1 class, yet the complete unpredictability of this race has been bizarre enough that I’m totally okay with how this year’s race has been going. It feels like none of the prototype teams in either class really have their crap together, and that’s the beauty of it.